Second, an additional disclaimer: I have been harshly critical of Lawrie in the two posts that I've devoted almost entirely to him. I'm not certain that I would like him much in conversation, but I actually do really enjoy watching him play. He's exciting to watch, in part because he's already a good player and in part because he's always putting in maximum effort. The enthusiasm he displays in every moment is, I think, unparalleled in baseball, and you can feel it rubbing off on the rest of the team. And the series of handshakes that he's designed with each of his teammates are ridiculous, but in a good way. ...is the same guy who did this a couple days ago. The culture of the game is to blame, too, of course. Players and umpires are all but encouraged to get in each other's faces and scream. The system by which umpires are evaluated and made accountable for their mistakes are entirely opaque. And it should be very easy to develop a program that can call balls and strikes with better accuracy. Baseball has made no effort to address any of those things. So, what I wanted to look at is where the punishment - four games - fits in relation to other suspensions, across various sports. In part, I want to see whether there's a consistent logic applied within baseball and across various sports; in part, and assuming that there is some consistency, I want to see if Lawrie's punishment fits it. Following from this starting point, then, I pulled together this list. in the head and give him a career-ending concussion. Is that "assumed risk"? 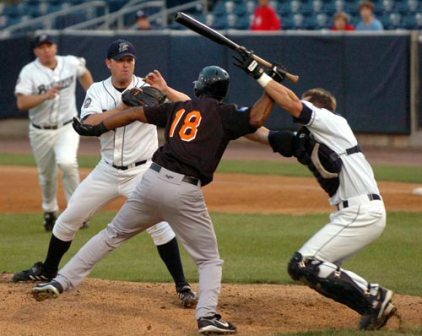 Second, baseball has been all over the place with the lengths of its suspensions. There are three different suspension lengths for three different umpire-bumping incidents, and Yadier Molina's bump-and-spit combo (where I'm probably being generous with "incidental" spit) got the exact same length as Alomar's unmistakably intentional spit 15 years ago. There should probably be some sort of standard here, but there clearly isn't. About the only thing that they can agree on is that pitchers should get about five games if they admit, or are proven, to have hit a batter intentionally. But this has less to do with how the infraction compares to other forms of violence than it does to the fact that starting pitchers only play once every five days. And here are the comparisons to some recent rulings in other sports leagues. The soccer suspension is completely out of whack with anything else that I've ever seen. It's actually maybe the nearest to the Lawrie incident, insofar as both throws seemed to be expressive of frustration and not an intent to injure. On the other hand, Benitez was trying to hit a referee, while Lawrie threw his helmet with such force that the possibility of accidental injury was greater (though still small). But that length is just nutty. And I've included the Raffi Torres incident in order to illustrate, again, the difference in punishments when we're talking players vs. officials. And while the NHL isn't anywhere near La Liga, when it comes to punishing players who lash out at referees, I think it's fair to say that they both take is a lot more serious than baseball does. I don't have any solid conclusion to end with. Even though baseball's punishments appear to have no strict system of application, they're all so short (mostly between two and five games) that it's difficult to argue that Lawrie's suspension is surprising or inconsistent with past practice. The real question, though, might be whether baseball's practice is a good one, because Lawrie's actions would certainly earn him a longer suspension in either the NHL or La Liga. But that's something that all of baseball would need to start thinking about.